Tulum is located 128 km from the city of Cancun. Enjoy an early morning tour of Tulum ruins that will satisfy your desire to visit Tulum without sacrificing a whole day of your vacations. This tour is ideal for those who want to be back to their hotel early in the afternoon and enjoy the rest of the day in other activities. With Alma’s LDS Tours, all of our guides are gentle, warm and have a testifying spirit. They definitely have a similar speaking manner and demeanor. You are privileged to get a great touch of Mexico and the Nephite/Lamanite heritage from our guides. It is a pleasure to sense how very closely they are connected to the Mayan lands and committed to the Church of Jesus Christ of Latter-day Saints. 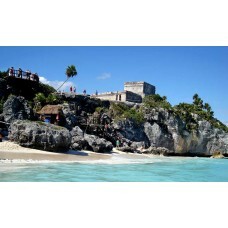 Perhaps at Tulum you’ll be surprised to see a Mayan, Book-of-Mormon-like setting perched as a light house on the shore. Tulum was built as a fortress city overlooking the Caribbean. The important structures here include the Castillo, a former temple and the Temple of the Frescoes with a 13th century wall painting. Tuesday , thursday & Saturday. Payment in full is required for official booking.